A man and a transgender woman charged in connection with the fire that ripped through a 126-year-old home in Boystown in April will get probation under a recently-accepted plea deal. Ryan Handzel, 20, and Keith L. Williams, 23, each pleaded guilty to one count of criminal damage on Monday in exchange for sentences of 12 months probation, according to court records. Police said Handzel and Williams both admitted to being inside the long-abandoned home at 651 W. Aldine moments before the fire was discovered at 6PM on April 24. 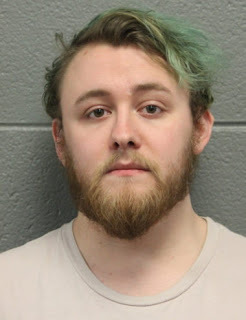 Bail has been set at $150,000 for Colin Weis, the 24-year-old Boystown man who’s charged with arson after police officers said they saw him attempting to light a couch on fire early Tuesday behind the Belmont Cafe, 930 W. Belmont. Cops were trolling local alleys in search of a burglary suspect when two officers came across Weis in the act of starting the fire, police said. The burglary suspect was subsequently found two blocks away.